Mylight is the Perfect Gift - If you're unsure of the design, why not let your loved one design their own. 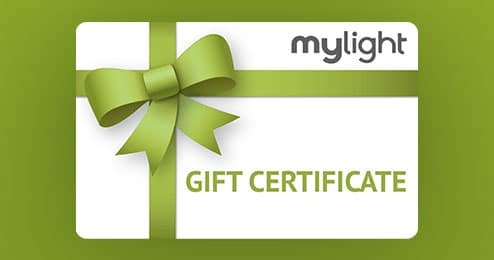 Fill in the form below and a custom Mylight gift certificate will be added to your cart. Once purchased, we will send you an electronic copy of your gift certificate that you can then forward on or print out. Gift certificates are valid for one year and can be redeemed by anyone, using a specially generated code that is entered in at checkout. Instructions are included on the gift certificate. Please read the Terms and Conditions in regards to Gift Certificates. Mylight Nightlights are the perfect gift. Let your loved one design their very own, one of a kind nightlight. Gift certificates are valid for all products for 12 months from the date of purchase. Gift certificates are to be used on one transaction only.